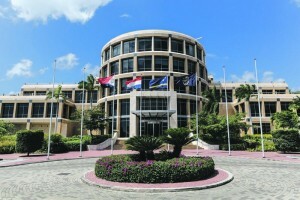 WILLEMSTAD - The situation at the Central Bank of Curaçao and St. Maarten (CBCS) is a priority for Curaçao’s recently-installed new Finance Minister Kenneth Gijsbertha (MAN). He wants to restore peace and order. CBCS is in danger of being left without top management. President-director Emsley Tromp is on non-active duty as a tax fraud suspect being prosecuted, while the two other directors Jerry Hasselmeyer and Alberto Romero are to retire later this year. Gijsbertha had already made certain arrangements with his St. Maarten counterpart Richard Gibson when he was Minister in the short-lived Koeiman Cabinet. He said the incomplete Supervisory Board, the lack of managing directors and the Tromp issue need to be tackled. The board currently has five members: two each from the two countries in the monetary union and as chairman former judge Robert Pietersz, appointed by the Joint Court as prescribed in CBCS’ statutes when the shareholder representatives (the two Finance Ministers) cannot agree on a chair. There should actually be three members for each country plus the joint seventh. According to Gijsbertha, the board decided on extending the contract of one of the departing directors with three against two votes. “This caused problems because such recommendations must be made by at least five members,” he explained. Gibson had indicated he might have to dismiss board members not acting in the best interest of the bank, but Gijsbertha is talking about expanding the board. Gibson’s letter requesting a security screening of, among others, the CBCS president-director has meanwhile been received by Tromp. The judge had ordered the Minister to provide access within three weeks in an Open Government LOB case. It was reported in March that Tromp had not passed the screening, which means he cannot get the “declaration of no objection” needed to fulfil his function. He has appealed that ruling. Hasselmeyer and Romero did pass the screening.